The Virgin Galactic SpaceShipTwo that crashed in the Mojave Desert earlier today was using a new fuel combination that Virgin Galactic had never used during flight before. 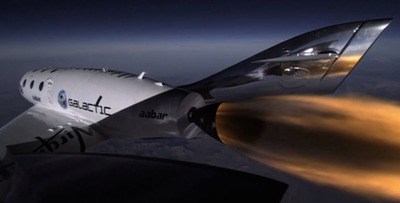 Virgin Galactic announced that they were switching from a rubber-based fuel to a plastic-based fuel last May after they successfully burned the fuel for about one minute. Right now, there is nothing that says the new fuel was the cause of the “in flight anomaly” that led to the crash. “Frankly, we had good performance from both of them, but as we look for the final range of test flights, we decided to go with the polyamide grain,” Virgin Galactic CEO George Whitesides told NBC News in May. It was thought that this new, plastic-based fuel would provide a longer, more energetic burn and help the SpaceShipTow fly higher. The fuel was also expected to provide passenger with a smoother ride. According to CNN‘s Joel Glenn Brenner, the SpaceShipTwo rocket engine burned for about two seconds after ignition, then stopped, restarted, and exploded during the deadly crash on Oct 31. The reason for the explosion is still unclear. Two passengers were aboard SpaceShipTwo when it crashed. There was one fatality.